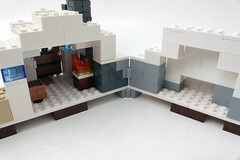 Last last week, I received a package from the LEGO CEE team and inside was the summer 2015 wave of the LEGO Minecraft The Snow Hideout (21120) and The Nether Fortress (21122) sent for me to review. 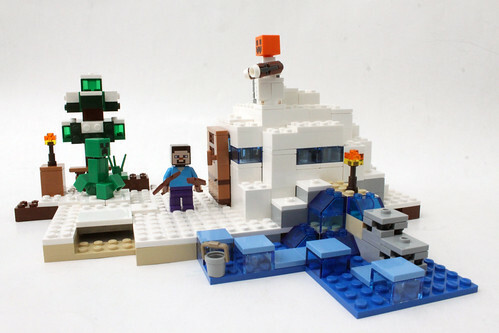 Although I haven’t done many reviews of the previous LEGO Minecraft sets, I have some knowledge of Minecraft since I used to play the game a few years ago. 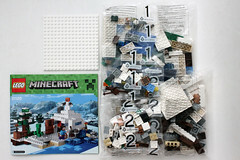 This review is for The Snow Hideout (21120) which contains 327 pieces and will retail for $34.99. 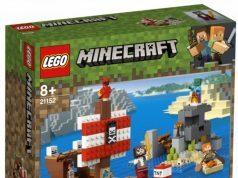 The box is a fairly fat box which has the standard LEGO Minecraft logo on the top are with the artwork filling out the rest. 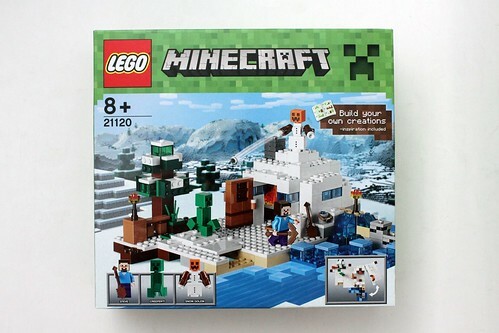 On the back of the box, there’s another angle for The Snow Hideout and it also shows lots of the play features that are included in the set. 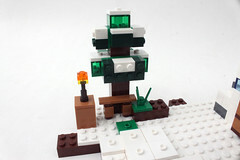 It also shows another build that you can create in this set using the same parts. The contents of the box includes two numbered bags, a white 16×16 plate, and an instruction booklet. 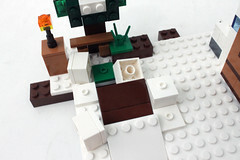 There are three minifigures to the set: Steve, a Creeper, and a Snow Golem. 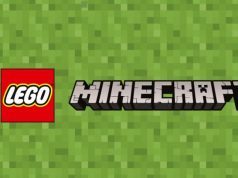 If you got any of the first wave of LEGO Minecraft sets, minus The Ender Dragon (21117), you’ve probably have this minifigure already. 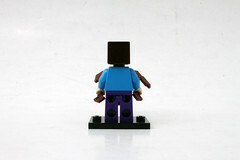 He’s no different here with his blue torso and purple legs. 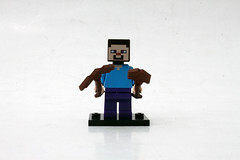 The head is the blocky kind with his face printed on the front. His accessories inclue a shovel and a pickaxe. 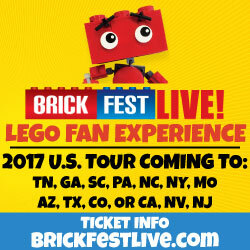 The next minifigure is the Creeper. It is an all green mob that has a fairly new body/leg mold. The body is completed with two 1×2 tile pieces. The head is a block with the Creeper face printed on. 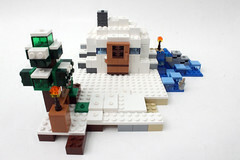 The final minifigure in the set is the Snow Golem. 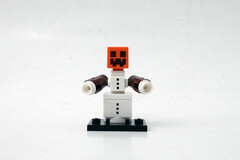 In the game, the Snow Golem is a friendly mob that is created with two snow blocks and a pumpkin/jack o’lantern block. 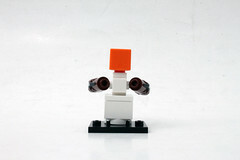 The Snow Golem minifigure is created the same way. There are a couple of printed white bricks and tiles with a printed jack o’lantern head to give it the look. The arms are brown stud shooters that shoot white studs to represent snow. 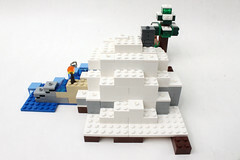 The Snow Hideout set is actually made out of seperate areas. 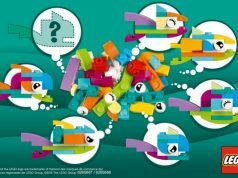 The first things you create are the small stuff like the crafting box and the fireplace as well as some coal blocks. Some of the larger things you create in the beginning is the tree and the watery area. 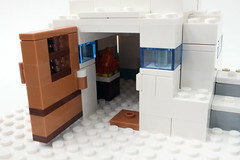 I do like these particular builds because they utilize transparent bricks which gives them some nice detailing. Following that, its on to bag 2 and here you create the hideout itself. From the original building instructions, the hideout seems to be on the edge of the coast. 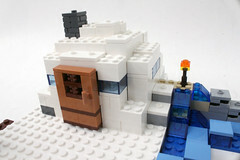 As the set name states, the hideout is covered in snow and is made up of mostly white bricks with some transparent blue bricks to simulate windows. The front door is on a hinge so it is able to open and close easily. 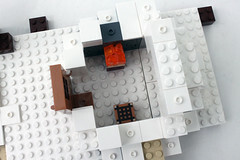 Inside the house, you put in the fireplace that you created earlier. On the backside of the Hideout, there’s a hinge that you can open up to reveal the inside. Other than that, the hideout is pretty bare. To the immediate right of the hideout is the watery area that you attach to the plate next to the house. 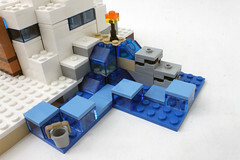 There are a couple of trans-blue 2×2 bricks that make some nice icebergs. In front of the house, there’s an area with a lever that involves the Creeper’s ability in the game. When you press down on the lever, the snow blocks blow up to simulate the Creeper exploding which they do when your character gets close to it. 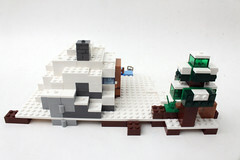 Overall, the LEGO Minecraft The Snow Hideout (21120) is a pretty decent set with a lot of useful parts. We do get a new environment and the neat thing about these biomes is that they can be created a lot of different ways to give your world a new look. 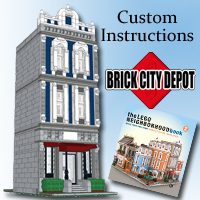 LEGO has also provided instructions for an alternate inspiration build which uses the same parts but in another way to create a different look. 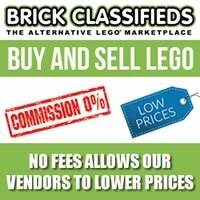 The minifigures are fairly reasonable. Of course Steve has to be included in the set because he is the main character of the game. The Creeper is a good addition since you can’t have too many of them. The Snow Golem is very fitting for the snow environment. 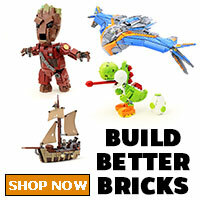 The LEGO Minecraft sets are perfect for whoever is a Minecraft player and wants to physically build their worlds. I believe the summer wave of Minecraft sets will be available on August 1st. 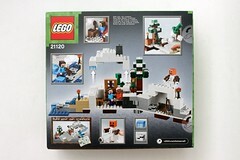 Again, I’d like to thank LEGO for sending in this set for review. I should have the the Nether Fortress built and reviewed in a few days. So what do you guys think of this set? Will you be picking it up? Let me know in the comments below.